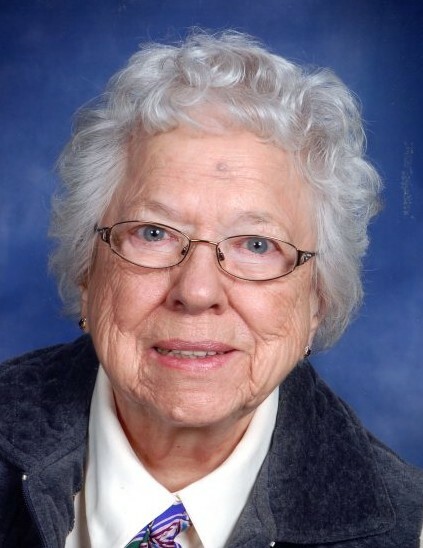 Gladys H. Stark, age 89 of Cottage Grove, passed away October 14, 2018. Funeral Service will be 11 AM Friday, October 19, 2018 at Rose of Sharon Lutheran Church, 6875 Jamaica Ave, Cottage Grove with visitation one hour prior. Interment Cottage Grove Cemetery. Gladys Helena Kautz was born on September 7, 1929 to parents Albert and Edna Kautz in Leaf River Township, Wadena County, Minnesota. She was baptized on March 10, 1930 at Bethany Congregation. Gladys attended a one-room country school house in District 11 and received her 8th grade diploma on July 1, 1943. She was confirmed on December 25, 1955 at Concordia Lutheran Church, South St. Paul. On October 25, 1953, Gladys married Kenneth Ben Stark at Grace Lutheran Church in South St. Paul. They had five children and made their home in Cottage Grove (1960). Through the years, Gladys enjoyed baking, gardening, crafts and sewing, even making quilts for each of her children and grandchildren. In 1982 she achieved her GED and later worked as a South Washington County School lunch room aid for 14 years. Gladys lovingly and devotedly cared for Kenneth during his 33 year battle with heart disease until his death in 2011. In 2014 Gladys moved to Norris Square, an assisted living community, where she lived for two years until her stroke. The past two years, she resided at Johanna Shores Care Center in Arden Hills. She is preceded in death by her beloved husband of 57 years Kenneth; siblings Dorothy (John) Braith, Viola, Richard (Thelma) and Robert. Loving mother to Ronald (Nancy) of Cincinnati, OH, Douglas (Mary) of Hugo, Gayle (Glenn) Kimmel of St. Paul, Steven (Ruth) Chisago City, Annette (Chris) Steele of Forest Lake; grandmother of Kyle (Ashden) Stark, Ryan Stark, Lea Steele, Allison Steele, Matthew and Benjamin Stark; great-grandchild Hazel; step-great grandson Gus; sisters-in-law Janet Stark of St. Paul and Esther (Dennis) Bemis of Marshfield, MO as well as many nieces, nephews and friends.